The more digital wallet holders the Oracle (Bitcoin, Etherium, DASH, etc.) has - the more effective the crypto-currency becomes for everyone, as wallet holders can transact with each at a fraction of a cent, & without borders. No, absolutely not. Currently to get a bitcoin transaction done you have to pay around one or two dollars, so it's actually quite expensive compared to regular banktransfers. Yes and in 1996 video over the internet was unrealistic, because if people used the internet at all they connected at 33kbps over their voice lines. People seem to have a hard time seeing where technology is and extrapolating to where it is going. Not really. When internet was slow you could envision faster speeds. For some companies it probably didn't happen fast enough (good luck with streaming video in 1996), but that was just inevitable technological progress. How fast it would happen and seeing what would and wouldn't be possible with that was of course the difficult part. Bitcoin (slash other blockchains) main innovation is that you can turn a large amount of computation power into shared trust. That really the core of the idea. The security (shared trust) only works because buying enough computational power to control the network is too expensive. That's why transactions with bitcoin or any other block chain based technology will never ever be cheap. Because if it would be cheap it would imply that the computational power that provides the block chain security would be cheap. And if that would be the case it wouldn't be secure anymore since you could rent computational power somewhere cheap and do what you want. Relative high transaction costs are the defining feature of block chains. It's the only reason it works. There is no clear technological path forward to improve that like you could see faster internet happening. To have shared trust with low transaction costs would require something completely new, and would probably make every existing block chain currency obsolete. That is where off chain transactions come into play. You don't really need your morning coffee purchase stored for eternity in the block chain. These problems will be fixed. Not really. The $ required to make it secure isn't really related to the number of transactions, but the value of the transactions being processed on the blockchain. I a hypothetical world where there are just a few blockchain transactions/hour attacking those would be just as valuable as a world where there are millions every minute, as long as they are in essence backed by the same amount of economical activity. PS. I'm doing all my transactions already off-chain, seems to work pretty well! I'm doing all my transactions already off-chain, seems to work pretty well! 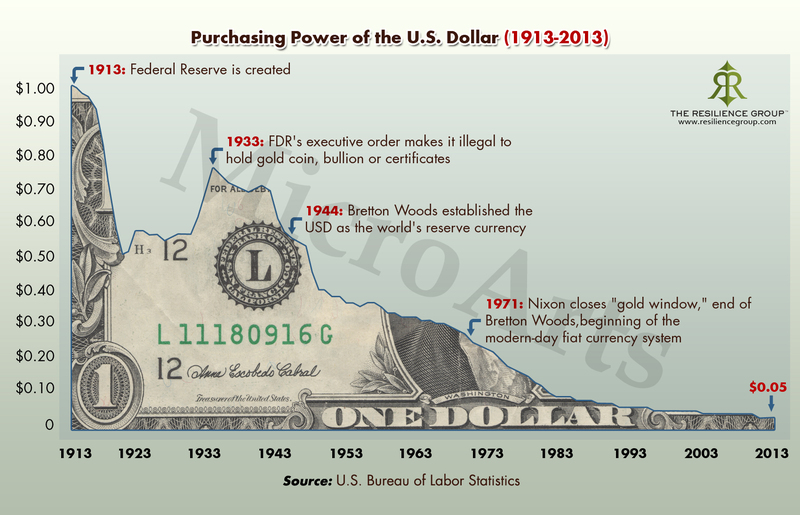 This is called inflation, that's why we invest, the Dow Jones is up 39,900% since the time this chart starts. Having your purchasing power eroded by high transaction costs is not obviously better than having it eroded by inflation. I suppose it depends whether you are using it as a store of value or a currency. Store of value of course. I didn't know inflation was 400% in the past year. I sold all my tax free savings account stocks in January and bought Bitcoin then added all new savings to Bitcoin and Ethereum since then mostly whenever there were big dips. Wow. I didn't even come close to going all-in like that. I'd have to go and figure it out, buy I've probably invested about $10K total in my entire basket of cryptocurrencies in the last 2 years, maybe a little less. That small amount is in the 6-figures now. Had I done what you did, I'd be retiring now. - What are both of your thoughts on cryptos going forward? Which specific cryptos are you most bullish on? I store my cryptos on Nano Ledger S and I am considering switiching to Xapo now that the amounts are getting bigger. I am also learning new password tricks. Basically you come up with at least 4 random words and that is your string. My computer guy explains that it takes advantage of human strength while to a computer it has high difficulty if the words are random. I had to stop using password database on my phone as MacAfee explains that phones might have hacks which record your screens. I do nothing on my phone and only interface the trading on a wired LAN never wireless. The specific crypto I am bullish on is EtherParty whose crowdsale is in days. They make smart contracts easy and the system is working and I met the CEO Kevin who is very smart, connected and capable and seems well able to lead a team of top programmers, many of who are multi-millionaires now. I consider it a form of cat herding so I admire such talent. The system is up an running and I saw demonstration of a working sport bet system and ICOs which took 2 minutes to put up on the Ethereum blockchain. One law firm is using their enterprise version to put all their legal precedents into smart contracts so they will earn subscriptions. I see strong network effects as I don't know others who draft contracts for clients then turn around and pay royalties to the client who paid when the same or similar contracts are sold to others. EP will therefore quickly amass the best selection of smart contracts and every smart contract will require the EP tokens as fuel. Prices are in USD so like BTC the coins are transactional and useful and to those users they don't care about the price. Like BTC there is limited supply but 50x greater at 1B but this supply will be used up as fuel and speculators like me will hoard so supply will diminish. Remember all the participants in EP watched their ETH increase 30-100 fold and many regret selling too early so I expect EP itself and its insiders to hoard. Their incentive is to make the EP to be super useful with a decreasing cost of use in USD through volume to create the strongest network effect possible. Then you borrow against the EP tokens instead of spending them. Companies that use smart contracts will have an incentive to buy EP early so their cost in terms of what they paid will be lower while the more they buy, driving up price the more their competitors will have to pay. Early adopters will lock in a massive competitive advantage with the more they buy and hoard, the greater the advantage. I like to hold assets with rising demand and shrinking supply and I see massive use. One market for instance is for gamers so they can do smart contracts to trade virtual assets etc.. Between BTC and ETH I prefer ETH until the hard fork when proof of stake is introduced. That will make holding ETH pay a return when you stake the tokens which many speculators will do. EP will also contribute to ETH demand initially. Long term I prefer BTC as the more decentralized the safer from having the supply increased and with the BCH bitcoin cash token you have two similar competing coins which will drive innovation faster by competition. I think that is likely why Jiwan supported its creation to improve the competitiveness of BTC and BCH as against ETH and others. EP will soon work with BTC as well through a deal with RSK. Legal contracts on BTC via RSK look to my programmer to be more secure as compared to ETH so long term I believe the legal community will prefer the more secure smart contracts once that is understood. My overall thesis is that cryptos are a tool of the people behind the curtain to further weaken nation states for their agenda leading to one world government. Cryptos will eliminate all banks who fail to adapt to cryptos which will be most of them. And worsening demographics due to the poison everywhere means that the pension promises will never be honoured except by increased mortality. So nation states will have ever greater difficulty to get their banks to buy their government bonds, the last of their 3 ways of getting money. (We are already taxed to the gills and we have given up the money printing power). So cryptos will make it possible for a few to amass great wealth and governments will learn how to tax it as their new way to continue the growth of the Leviathan state. Cryptos track every transaction so it is the perfect taxation money making scheme. You pluck fewer feathers more often with a rapidly expanding flock so government will be the primary beneficiary from crypto but since this type of taxation is only possible on the super-state level nation states will not enjoy this benefit (watch for the formation of 10 super-states for this reason). BTC to $100K will further this agenda more quickly as it is a powerful incentive to save instead of spending and it will attack the weakest currencies most and the USD least (USD has the only effective massive capital pool which can absorb the vast wealth of everyone so there is no where else to go and the USD companies are the best positioned to benefit from increasing digitalization of the unbanked masses). (Just remember when the USD crypto comes out and you live in the US empire switch to the USD crypto ie buy the crypto for appropriate super-state you live in). Cryptos will drive rapid improvements in computing power and soon will also drive rapid decrease in the cost of electricity. The latter occurs because the 10 super-states will compete to see which faction will end up in control of the one world government (actually it is more likely the factions doing the fighting will be the corporations instead of the governments to compete except to enable their corporations to dominate as the fighting will be done by non-poisoned scientists, technologists and thinkers, chipped soldiers, AI and robots) but in the age of super-weapons that competition will be mostly a technological race. Notice the US bill to allow private sector to exploit and own space resources. If you harvest a $1T asteroid you had better have your own super-weapons to protect it. The bill would not be tabled unless there was some amazing technology available to US firms. Finally the discoveries since WWII will be utilized, at least by the US firms given access, instead of being suppressed. For instance, Boeing will finally get to use their ion engines. Accordingly I agree with one estimate that the crypto economy will end up 20X the size of the current economy. Many new businesses are possible and benefit from the blockchain enabled trust relationships so look for 20 new Amazons for every Amazon, Google etc.. Trust is a key strength of Western Civilization and will now be available to everyone. (Our sole remaining advantage will be reason and rule of law, both which seems to be increasingly lacking (sadly, also on CBC radio). It is a pleasure to find reason on this board. Best idea for me currently is doing nothing. Cash and Berkshire. I am very ignorant about Bit coin but when crowds are in a mania, they will come up with perfectly sounding reasons for doing what they are doing.